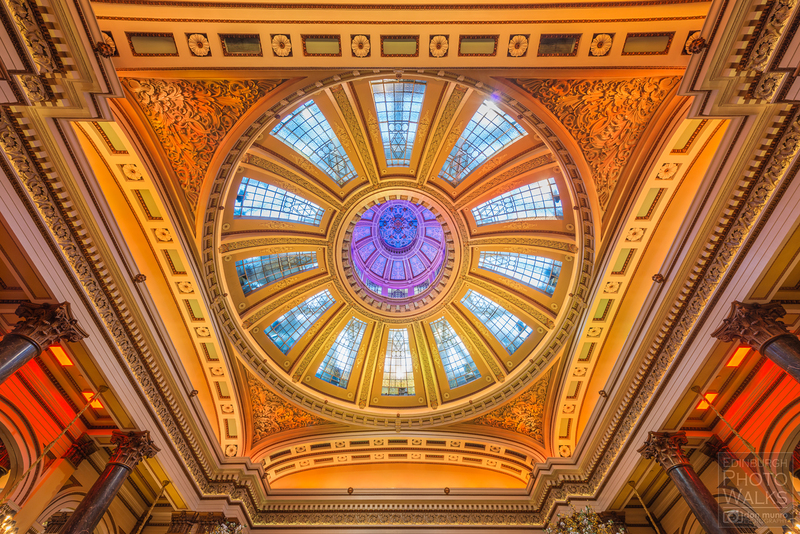 Welcome to the first EVER blog post here on Edinburgh Photo Walks and what better way to start than to share with you some images and history on what must be one of the most spectacular buildings within Edinburgh’s New Town – The Dome. 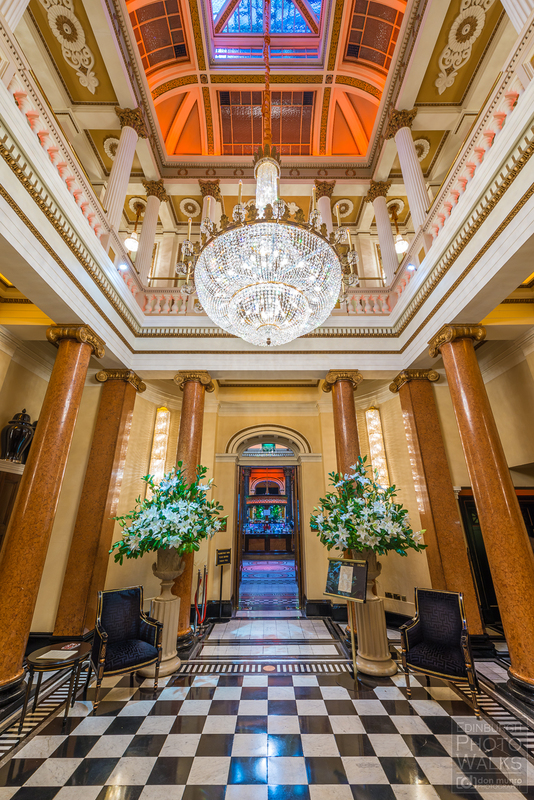 Located towards the eastern end of George Street, this beautiful building was originally commissioned by ‘The Commercial Bank of Scotland’ and was designed by architect David Rhind (1808-1883). 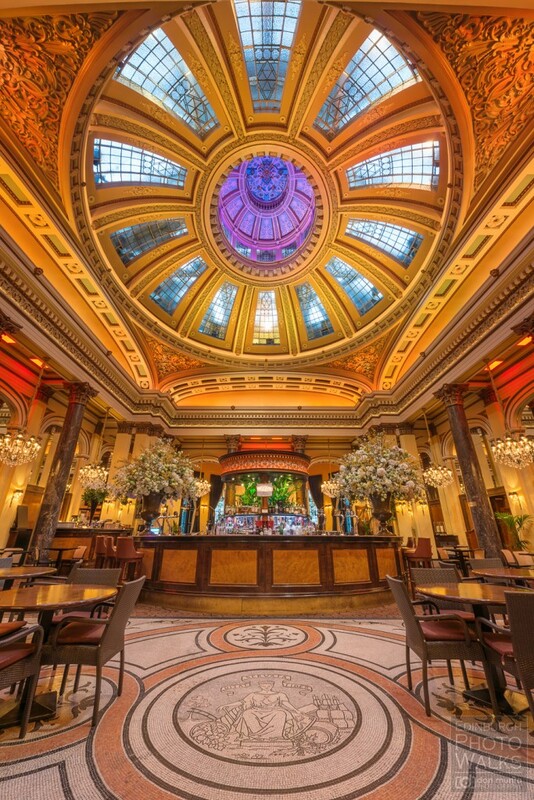 I always assumed the grand facade with its gigantic Parthenon-like pillars and ornate pedimental (the triangular shaped structure above the pillars) was directly inspired by the classical Greek style of architecture but apparently it was inspired by William Henry Playfair’s ‘Surgeon’s Hall’ building, itself inspired by what’s more specifically known as the Graeco-Roman style. Construction started on the 4th of June 1844 when a wealthy Leith Merchant named James Wyatt had the honour of laying the first foundation stone. 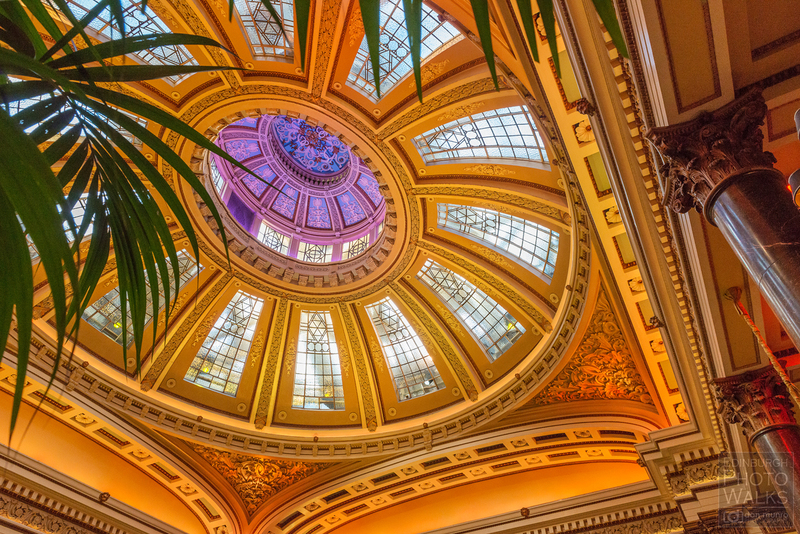 This is an image of The Dome taken during the festive period. In 1959 ‘The Commercial Bank of Scotland’ and ‘The National Bank of Scotland’ amalgamated into what was known as ‘The National Commercial Bank of Scotland’. The building operated as their head office for another ten years until 1969 when this bank was amalgamated with ‘The Royal Bank of Scotland’. With its head office a short distance away in St. Andrew Square ‘The Royal Bank of Scotland’ decided to concentrate its administration and the building lost its designation as head office. Things were set to change again when ‘The Royal Bank of Scotland’ decided that keeping the building was no longer viable. In 1993 the building was sold to a company called ‘Caledonian Heritable Ltd’ which converted the bank into what you see today. 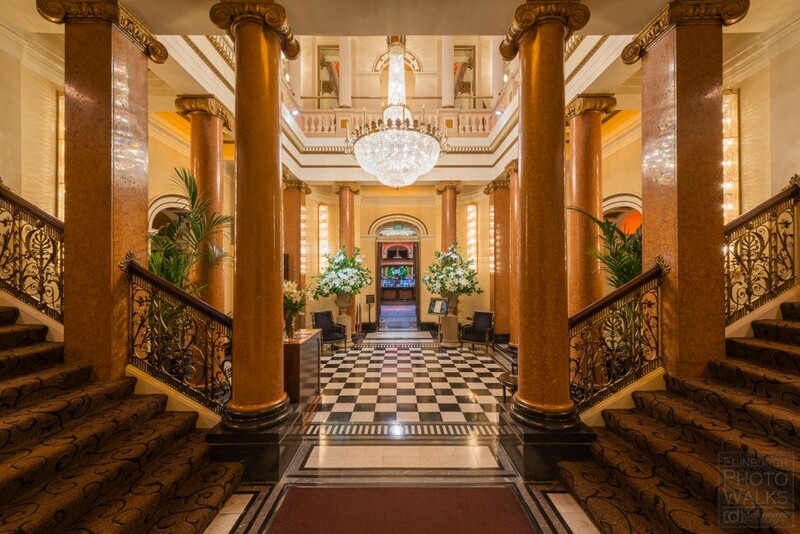 Upon entering the building through the revolving doors you immediately enter a grand space flanked by two opposing staircases and grand fluted columns. 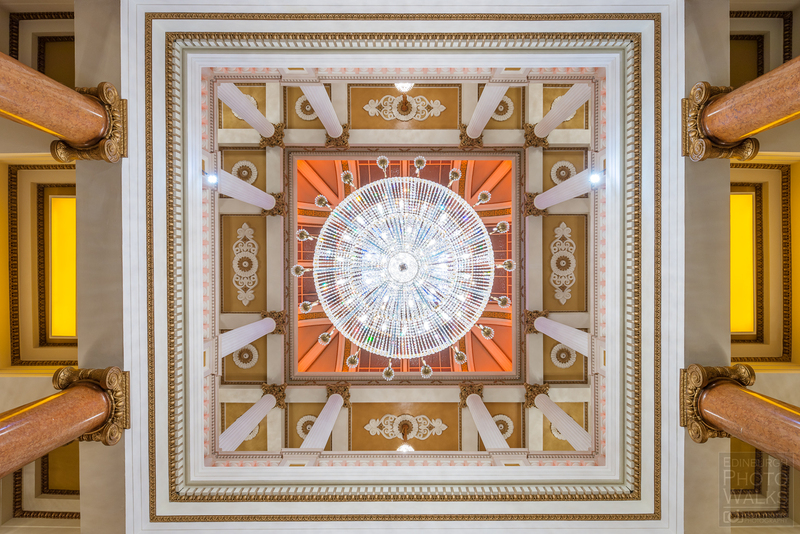 One of the most impressive features within this space is the spectacular chandelier hanging from the top-lit square hall. 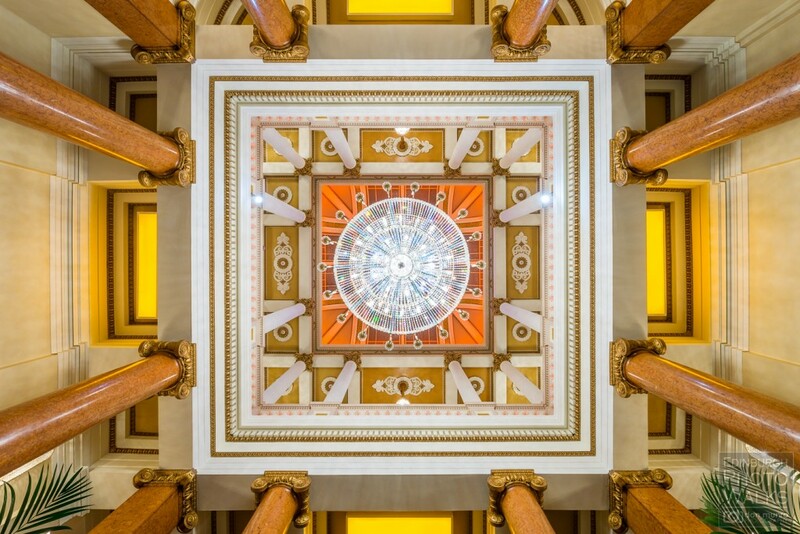 Position yourself directly under the chandelier and look up for this impressive view. I actually lay on my back to capture this image and used a very wide angle lens. This is another image taken from the same position but slightly more zoomed-in. 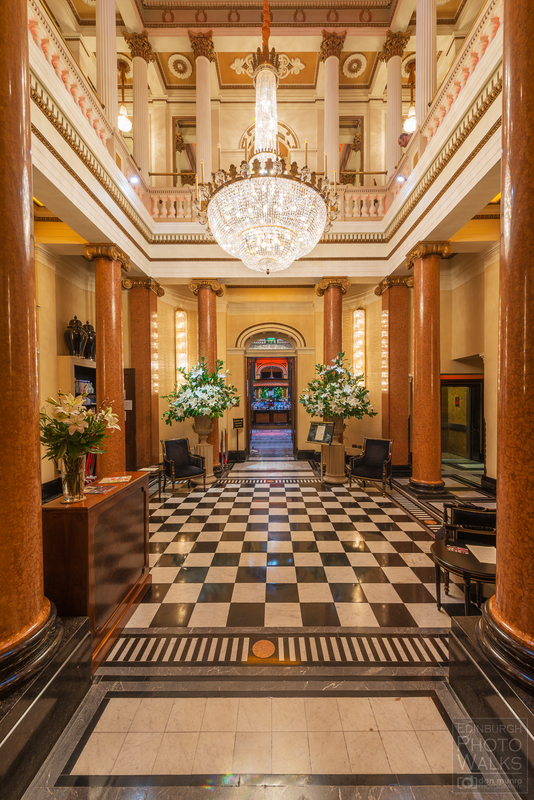 Once you’ve taken in the splendour of the square hall it’s time to enter through another set of doors and into what was once the grand telling hall. With mosaic flooring, a resplendent circular bar, Devonshire marble Corinthian columns, and a beautifully lit arched ceiling with a coffered central dome, this is the architectural highlight within this spectacular venue. It surely is one of the most beautifully luxurious places to enjoy a delicious selection of food and drink within the city. When standing at the bar, this is the view looking up. It’s easy to get distracted with such a sight so don’t forget to place your order. Wherever you choose to relax with your drink or meal you can always be sure to enjoy the ambience and opulence of the surroundings. 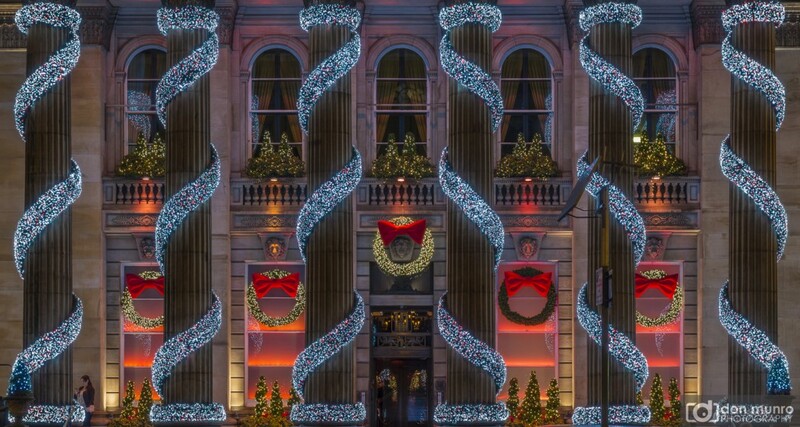 This is another image taken at the front of the building during the festive period. All images taken by me, Don Munro. Please feel free to share the link to this blog with your friends. 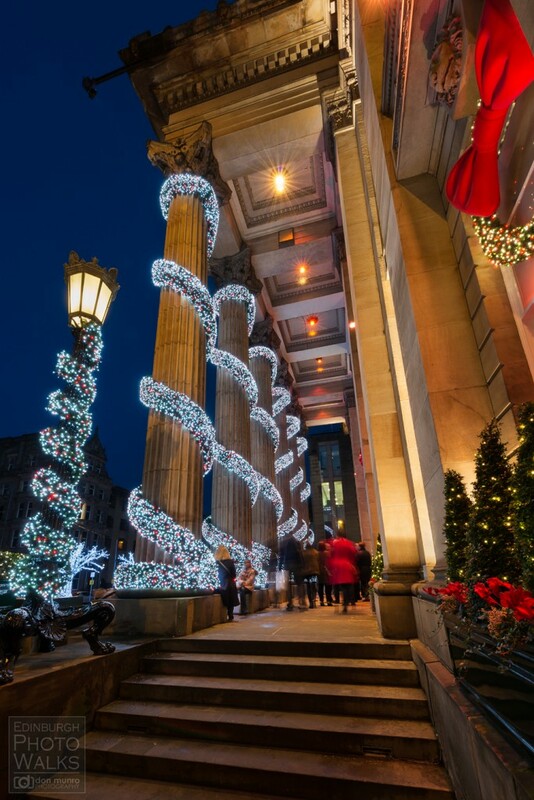 If you’d like to see more images of Edinburgh you can do so by viewing my gallery. I also offer Photography Workshops.